Kemlon Products and affiliates have been manufacturing components for subsurface geophysical instruments and other hostile environments since 1950. Today, Kemlon manufactures a wide variety of electrical connectors for high pressure applications. This catalog contains one product line of multi-pin connectors commonly used inside of instruments. This group of connectors is designed to be used in a non-conductive oil system or as a back-up to a primary system where an electronic section of an instrument must be protected. Glass sealed and plastic molded connectors are contained in this catalog. The glass sealed connectors have pins individually fused to the metal body to obtain a high pressure rating. The plastic molded connectors utilize beryllium copper pins tor a high current rating. The glass sealed connectors found in this catalog are constructed of 304 SS, Inconel 600, or Inconel X-750 bodies and 52 % nickel alloy or kovar pins. The Inconel X-750 material is substantially stronger and helps produce a connector that is capable of a higher pressure rating for a given diameter. However, the Inconel X-750 is more costly to fabricate. Inconel 600 helps produce a connector with better corrosion resistance and thermal shock resistance than 304 SS. Other materials of construction may be available upon request. Kemlon manufactures a complete line of contact blocks and female connectors to plug onto the male connectors in this catalog. These are constructed of high temperature molded plastic capable of operating at 260'C. They have replaceable inserts, which are available in copper or high temperature nickel alloy. The insulation resistance of Kemlon glass bonded connectors is a function of the temperature. Minimum values of insulation resistance for kemlon glass-bonded connectors are shown below in megohms at 500 volts. Note that the insulation resistance at room temperature is greater than 5000 megohms. At 200'C it is greater than 200 megohms and at 260'C greater than 50 megohms. See table below. The maximum test voltage and the maximum recommended operating voltage are shown on the individual pages in this catalog. The chart below shows the intermateability of our plugs and receptacles. Row one mates with row two. Note that #16, #12, and #8 pin patterns found in this catalog are equivalent to MIL-C-5015-G normal key position. The face dimensions of Kemlon receptacles are designed to mate to connectors which are MIL-C-5015-G threaded coupling plugs with sockets normal key position. The #20 pin patterns are not found in MIL-C- 501 5-G and connectors contained here are unique to Kemlon. 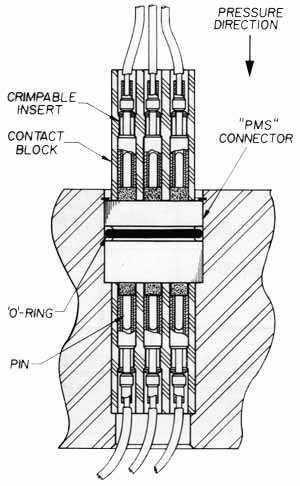 In most cases Kemlon connectors are shown in this catolog with straight pins. However,solder cups, or in some cases, eyelets, may be requested to aide in soldering. Solder cups and eyelets are available upon request. Kemlon glass sealed connectors are fabricated to meet or exceed a helium leak test of 10-8 cc/sec at 15 psi differential pressure. Representative samples are inspected using a mass spectrometer helium leak detector to insure product integrity. 100 % batch inspection can be performed at an additional charge. All pins, solder cups, and socket contacts found in this catalog are gold over nickle plated for maximum electrical contact. All gold plating is done in house to Kemlon's strict procedures, which meet or exceed MIL-G-45204-C specification of 20 microinches minimum thickness unless otherwise specified.Plating thickness is carefully monitored with beta back scatter instruments. Tin plating is also available as an option upon customer request. Kemlon maintains a quality control program with complete manufacturing documentation and traceablity. Kemlon's program exceeds the system requirements of MIL-I-45208-A. In addition a written schedule for calibrating gages, measuring and test equipment is strictly followed in accordance with MIL-C-45662. Kern Ion inspects all "first parts" and samples of all sub-assembly components prior to final assembly. During final inspection, electric test for insulation resistance and dielectric withstanding voltage are performed on 100 % of the final assemblies prior to shipment. Kern Ion also routinely performs pressure tests and maintains vessels for testing in water and oil to 25,000 psi.